For dinner at home, with or without company, I like to serve asparagus because fresh asparagus can get cleaned, trimmed and steamed in the microwave in less than 10 minutes. I steam the “spears” just to the point where they are tender but still have a bite to them. Then I just add a sprinkle of salt, pepper, and sometimes a squeeze of fresh lemon juice, and the asparagus is ready to serve. Asparagus is sold by the bunch. There are approximately 14-18 spears of asparagus per bunch. Count on about 3 to 5 spears per serving. Make only what you are going to eat for dinner. Asparagus cooks really fast in the microwave so there is no point in making enough for leftovers. If you are not going to use it immediately, wrap it tightly in plastic wrap and store it in the refrigerator. It should keep about 3-4 days. Wash one bunch of asparagus under cool running water. Trim away the bottom 1/3 of the stalk. The tip of the asparagus is very tender, but the farther down you go on the stalk, the tougher it gets. If you bend the asparagus it will naturally snap at the point where it goes from tender to tough (which is usually about 1/3 of the stalk). Leslie demonstrates this method in startcooking.com’s post on Roasted Asparagus with Garlic Sauce. You can now use the new shorter “broken” asparagus as a guide to cut the rest of the bunch. Peel the stalks so that they are the same width as the tip. This ensures even cooking. Really thin stalks of asparagus do not need peeling. Lay the asparagus two to three deep in a rectangular dish. Set the microwave on high heat and cook the asparagus about 2 minutes and 30 seconds. If you want your asparagus to be more tender, cook it for another 30 seconds or so. Be sure not to overcook asparagus. Overcooked asparagus not only turns to mush, but it develops into a very unappealing shade of green. …or in a colander and run cold water over the spears. For more startcooking.com tips on blanching vegetables check out Keep it Fresh: Learn How to Blanch. What`s your favorite sauce to pour over aparagus, Kathy ? My mom would make a mayonaise with herbs and mix the mayo with beaten eggwhites to make a kindof moussy mayo delight. Not for calorie counters ! For me the best sauce for asparagus has to be just some soft butter which melts into an oozing mess around the spears and then a little turn of finely ground black pepper. English asapragus is wonderful. It only has a short season, but whne it’s fresh and new – it just can’t be beaten. If I’m eating asparagus at home I like it cold, with just salt, pepper and lemon juice. My most favorite *brunch at a restaurant* dish is Eggs Benedict with asparagus. The low calorie asparagus justifies all that hollandaise sauce! My husband and I were wondering about the stems ,it seems to be a waste to throw out and we were wondering if I cut just the bottom of them off can we eat the rest of the stem and of course the vegetable it self. Hi Natalie, Yes by all means eat the stems! If they are thick I would peel them first. The stems will take a bit longer to cook than the more delicate tops. Enjoy! Although it involves the same prep work, a very easy, quick, but amazingly delicious way I’ve found to prepare asparagus is roasting. Just drizzle some olive oil over the asparagus and distribute evenly. Then place in the oven (set to broil) on a non-stick pan. Allow the asparagus to get ‘crispy’, remove, and while still hot, squeeze a lemon over the top and season with Kosher salt. Hi Mia, what a great way to cook asparagus! Quick and easy and it sounds delicious! Thanks for sharing! hello! thank you for your very informative step by step guide. i’d never cooked asparagus before and so this was extremely helpful. Hi Letti, glad to be of help! Asparagus is so good, hot or cold! Cheers! I didn’t know how to cook asparagus correctly, in the past I cooked it in salted water,…which really wasn’t successful, but after reading I can microwave them for 2 1/2 minutes I thought I would try. this method. I made a Bearnaise sauce and added a small chopped onion (fried) and then a small tomato (fried),mixed them with the sauce , heated for a couple of minutes and then served over red salmon fillets and the asparagus. It was a delicious combination. WoW! Ken you really do know your way around the kitchen! Your Bernaise sauce sounds wonderful! For those of you who do not know what a Bernaise sauce is, click here! Let me Thank You Very Much For yr suggustions on the stems we now enjoy the whole veg. LB and Natalie-I’m delighted to be of help! Years ago, my old friend Roger taught me the peeling trick with asparagus. The whole stem gets cooked evenly and there is very little waste! I cook it with a little bit of butter, lemon juice, and seasoned salt. It’s absolutely wonderful! I’m with you Rachel! Easy and delicious! Place the cooked asparagus in a pan with butter, top with grated parmesan; add and egg to the side an fry it sunny side up. This is an italian way of serving asparagus. I put asparagus in a plastic bag and add italian dressing..zip..shake to coat them evenly and cook in the oven for 10-15 minutes. Alessandra, and j.p, these are perfect suggestions for startcooking – Thanks! j.p – What do you set the oven temperature at? i set it to 350 usually. I grill asparagus all the time. Toss it with olive oil and a finely-ground seasoned salt (I use Adobo with lemon). Put on a hot grill, turn after 2-3 minutes. That’s it! Seems too many ways to cook asparagus , the important thing is to add some thing to remove the bitter (a bit) .Most of the Chinese may add some oyster sauce to make it perfect. Sounds good! I though cooking fresh asparagus was going to be more difficult. Steaming fresh vegetables in the microwave is a really quick and healthy way to add a bit of green on your dinner plate! Incredible how the US can mess up cooking. Asparagus is to be cooked on a stove, with the stalks tied in a bundle so they stand up on their own. You’re supposed so put them in water so that the tips are not immersed in water. This prevent overcooking of the tops but assures that the bottoms are well-cooked. Somewhere in Europe they even sell a specific boiler for this purpose, with a small enough diameter so that tieing is not necessary. Yurop, Thank-you for sharing your method of cooking asparagus. Standing the asparagus up, tied or in a special pot, is just one of the many different ways you can cook asparagus. Peeling the asparagus, so that the stalk is the same thickness as the tip, ensures even cooking. 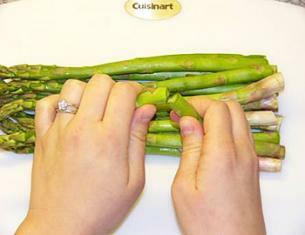 If the stalks are all really thin to begin with, then it is not necessary to peel the asparagus. Another good thing to add is balsamic ving. dressing. It adds a great flavor. What is the best food to accompany asparagus as I’ve never made this before. My boyfriend suggested it with hollandaise sauce which I bought, so whats the next step please. Everyone has a favorite way to serve asparagus! Hollandaise Sauce is classic but there are so many more choices as you can see by the comments above. If we are going to grill the asparagus, should we blanche it first? Just lightly coat it witih olive oil when we grill it? What do you suggest? Hi Amy, no it is not necessary to blanch asparagus before grilling it. It will cook up in no time! I have discovered you can also fry it in a pan with just a bit of oil and it come out beautifully! 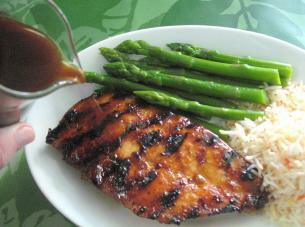 I discovered I loved asparagus when I had it grilled and drizzled with melted butter and garlic. I began experimenting and I think I have tried almost every way mentioned here. I usually just put some oil and freshly minced garlic in a pan and cook it all in the same pan for abot 3 min. Sometimes I sprinkle fresh parm cheese, bacon, or almonds over the asparagus. My very favorite way is to wrap it in bacon and garlic and bake for 20 min. =) I love asparagus! Jenny that sounds wonderful! Cooking the garlic is the key for me. I find raw garlic has too much of a “bite” and the garlic breath afterwards is a killer! Thanx for all these variations – hubby & I are gonna try a few… sounds de-lish !! Wow! 15 minutes sounds like an awful long time to steam asparagus! Is it standing up when you cook it? I have never cooked asparagus, but am planning on trying it for the first time tomorrow. Thanks for all the great ideas. That’s great Dana! Be sure not to over cook the asparagus. It should be “tender-crisp” and not mushy. I really love that you can serve asparagus either hot or cold – and it is great either way! Hey!!! some of us like it mushy… like me.. i prefer it so that it melts in my mouth. I guess that makes me weird. Thank’s for recipes ,is easy to follow every step and very helpful.I have never cooked asparagus but I want to try.I’m from Romania and here asparagus is not in everyday menu is more “wow,what is this?”…Ha.Have a nice day everybody. Thank you for your cooking suggestion! I’ve always loved asparagus but have never made it because I thought it would be hard to make. But now, with your instructions, I got some asparagus today and I can’t wait to make it! Asparagus is indeed a GREAT vegetable! I love it served either hot or cold! Rather than cut off ends try snapping them off as the tough part will come away and you won’t waste any tender part or fail to remove any tough part. Also the tough parts chopped and added to a vegetable stock really help give great taste if you want to make a risotto with asparagus, don’t throw them away. I love warm asparagus drizzled with good olive oil and a litttle melted butter and freshly grated parmesan….angel food! Thanks for those tips on cooking asparagus! Grated parmesan is a great topping idea. I find peeling thick asparagus to work better than snapping. Either way, asparagus is one of my favorite vegetables. I just bend the stalk till it snaps. It’s more fun than cutting them all the same size. I look for uniform, thin stalks when I buy; and try to wait for the price to be reasonablely low, in season in the spring is best since its local. I’m with MrsDM, I use a steamer basket in a large pot and simply lay the asperagus in the basket. I add it after the water boils and cook 3-5 minutes. I like asperagus too much to want to peal it. Finely minced garlic sauted in butter is my favorite addition but there are many other recipes that are good too. I will try some of those above. Thanks! This was my first time cooking asperagus and they came out great! 2 1/2 minutes in the micro – who knew! Thanks! It’s just that easy and just that quick! Hi this asparagus recipe is simple and easy! Thank you for making it sooooooooooooo easy! I think my mom would love it! I am wondering? Again THANK YOU for making it so easy! i have tried alot of different ways of cooking them. my favorite is to make a cheese sauce witch i add a twist to it with some red cooking wine(2 tble spoons) and diced red pepper. i also use just a small amount of pepper jack cheese about 3 tablespoons. it have a nice little snip to it. its fun to experiment with different cheese. Hi Nick, I love the idea of adding the diced red pepper! Thanks for the tip. Is it true that Asparagus is high in Anti-Oxidents and can prevent & even Cure some Cancers? There are many nutritional benefits in asparagus but on its own it does not cure cancer. Wouldn’t it be wonderful if it did! What a great idea! Talk about a flavor explosion! i was struggling so much with finding something to go with my valentines steak recipe…but heres the answer! i never thought of asparagus, but it will go so well and be delicious! Good Luck Britney! Just remember not to over cook your asparagus. My favorite way of cooking asparagus is to place them in a dish, pour olive oil over them, then sprinkle pepper and Kosher salt over them, then toss until evenly coated. Either grill them on a bbq or a grill pan on the stove for about 4-5 minutes depending on the thickness. You want them to have a little crunch when you bite into them, you don’t want them to be really wilted. Great recipe! Cooking asparagus in a fry pan is so much less time consuming than roasting it in the oven. Thanks for sharing! thanks so much for the help on this asparagus. My hubby just asked me for this and I had never cooked it in my life, I personally hate it. One of those things my father forced me to eat as a kid and cannot go that route again…But I will gladly cook it for him. How easy! Your are most welcome Penny! Good luck developing your cooking skills. I just came across your site when browsing the web for new recipes. Here in Austria, white asparagus is far more popular than the green variety. An old-fashioned, but still common way with asparagus is serving it “à la polonaise”: melt two knobs (walnut size) of butter in a non-stick pan over medium heat. When melted, add 2-3 tbsp of stale, white breadcrumbs and fry, stirring constantly, until the breadcrumbs turn golden brown in colour. The mixture should be rather runny, so you might need to adjust the quantitiy of butter or breadcrumbs a little bit. Pour over the hot, cooked asparagus spears and top with some finely chopped, hard-boiled egg. Thanks Christian – your recipe sounds delicious! White asparagus is usually MUCH more expensive than green asparagus here in the USA. I love fresh vegetables with hummus! It is a wonderful summer snack or lunch. Get some really scrummy yummy good ham and drape over the asparagus (in the middle so you can still see the ends sticking out), pour over some Hollandaise sauce or melted butter, and top with a hard-boiled egg that you crumble between your fingers. I think this is the French way of serving them. Eat with some baby new potatoes. Not so good if you’re on a diet, but definately worth putting on a pound for! I’m sure it works with green asparagus as well! finally i have tips on how to cook asparagus ,thank you all so much ,all of you have a wonderful day. You may find a surprise if you search “the truth about cooking with a microwave”. The short of it, microwave cooking changes food chemically that your body does not recognize it as a food and so can hang around in your body. PLEASE don’t take my word for this. Look it up for your safety. Some countries ban them. No Joke! I have never cooked asparagus before in my life, I stumbled across this page and I’m glad I did. Quite underrated is the old asparagus, now I have have 3 green vegetables that go quite nicely with my prime rib. Thanks Kathy! Thanks – this is a great site to learn how to cook! I love asparagus too. We roast it with a little olive oil and salt and white pepper. After it is done we just drizzle a small amount of balsamic vinegar over it. Tastes great. We also love to grill it with just a little olive oil and salt and pepper. Thank you so much! This site has great content. Keep it up.